Definition at line 20 of file PeekingPeerConnector.h. Definition at line 23 of file PeekingPeerConnector.h. References cbCheckForPeekAndSpliceDone(), checkForPeekAndSplice(), checkForPeekAndSpliceDone(), checkForPeekAndSpliceGuess(), checkForPeekAndSpliceMatched(), data, error(), getTlsContext(), handleServerCertificate(), initialize(), noteNegotiationDone(), noteNegotiationError(), noteWantWrite(), Security::PeerConnector::request, serverCertificateVerified(), and tunnelInsteadOfNegotiating(). References Security::PeerConnector::CbDialer::answer(), Security::PeerConnector::callBack(), Security::PeerConnector::callback, Security::EncryptorAnswer::error, error(), AsyncCall::getDialer(), Must, and NULL. Referenced by Security::PeerConnector::initialize(), Security::PeerConnector::noteNegotiationError(), Security::PeerConnector::serverConnection(), Security::PeerConnector::sslCrtvdHandleReply(), Security::PeerConnector::sslFinalized(), and Security::PeerConnector::swanSong(). References Security::PeerConnector::CbDialer::answer(), Security::PeerConnector::callback, Security::PeerConnector::closeHandler, comm_remove_close_handler(), Security::EncryptorAnswer::conn, debugs, AsyncCall::getDialer(), Must, NULL, ScheduleCallHere, and Security::PeerConnector::serverConnection(). Referenced by Security::PeerConnector::bail(), checkForPeekAndSpliceMatched(), Security::PeerConnector::negotiate(), Security::PeerConnector::serverConnection(), and Security::PeerConnector::sslCrtvdHandleReply(). Definition at line 29 of file PeekingPeerConnector.cc. Referenced by checkForPeekAndSplice(), and PeekingPeerConnector(). References BIO_get_data(), Security::PeerConnector::certsDownloads, debugs, Comm::Connection::fd, fd_table, Security::PeerConnector::getTlsContext(), SBuf::length(), Security::PeerConnector::MaxCertsDownloads, Security::PeerConnector::negotiateSsl(), NULL, SBuf::rawContent(), Security::PeerConnector::serverConnection(), Ssl::SSL_add_untrusted_cert(), Security::PeerConnector::startCertDownloading(), Ssl::uriOfIssuerIfMissing(), and Security::PeerConnector::urlsOfMissingCerts. Referenced by Security::PeerConnector::startCertDownloading(), and Security::PeerConnector::CbDialer::~CbDialer(). References BIO_get_data(), debugs, HttpRequest::downloader, Comm::Connection::fd, fd_table, CbcPointer< Cbc >::get(), Security::PeerConnector::getTlsContext(), Security::PeerConnector::MaxNestedDownloads, Ssl::missingChainCertificatesUrls(), Downloader::nestedLevel(), Security::PeerConnector::request, Ssl::ServerBio::serverCertificatesIfAny(), Security::PeerConnector::serverConnection(), Security::PeerConnector::startCertDownloading(), and Security::PeerConnector::urlsOfMissingCerts. Referenced by Security::PeerConnector::noteWantRead(), and Security::PeerConnector::CbDialer::~CbDialer(). Initiates the ssl_bump acl check in step3 SSL bump step to decide about bumping, splicing or terminating the connection. Definition at line 46 of file PeekingPeerConnector.cc. References ACCESS_ALLOWED, ACLFilledChecklist::al, Security::PeerConnector::al, ACLChecklist::banAction(), BIO_get_data(), Ssl::bumpBump, Ssl::bumpClientFirst, Ssl::bumpNone, Ssl::bumpPeek, Ssl::bumpServerFirst, Ssl::bumpSplice, Ssl::bumpStare, Ssl::bumpStep3, cbCheckForPeekAndSpliceDone(), HttpRequest::clientConnectionManager, Comm::Connection::fd, fd_table, RefCount< C >::getRaw(), handleServerCertificate(), ACLChecklist::nonBlockingCheck(), NULL, Security::PeerConnector::request, ConnStateData::serverBump(), Security::PeerConnector::serverConn, ACLFilledChecklist::syncAle(), and CbcPointer< Cbc >::valid(). Referenced by noteNegotiationError(), noteWantWrite(), and PeekingPeerConnector(). Definition at line 37 of file PeekingPeerConnector.cc. References allow_t::allowed(), checkForPeekAndSpliceGuess(), checkForPeekAndSpliceMatched(), and allow_t::kind. Referenced by cbCheckForPeekAndSpliceDone(), and PeekingPeerConnector(). Definition at line 115 of file PeekingPeerConnector.cc. References Ssl::bumpBump, Ssl::bumpSplice, Ssl::bumpStare, HttpRequest::clientConnectionManager, debugs, Security::PeerConnector::request, and CbcPointer< Cbc >::valid(). Referenced by checkForPeekAndSpliceDone(), and PeekingPeerConnector(). Definition at line 78 of file PeekingPeerConnector.cc. References Ssl::ServerBump::act, action(), Security::PeerConnector::al, BIO_get_data(), Ssl::bumpBump, AccessLogEntry::SslDetails::bumpMode, Ssl::bumpSplice, Ssl::bumpTerminate, Security::PeerConnector::callBack(), clientConn, HttpRequest::clientConnectionManager, Comm::Connection::close(), debugs, Comm::Connection::fd, fd_table, Must, Security::PeerConnector::noteWantWrite(), Security::PeerConnector::request, ConnStateData::serverBump(), Security::PeerConnector::serverConn, splice, AccessLogEntry::ssl, ConnStateData::sslBumpMode, Security::PeerConnector::sslFinalized(), Ssl::ServerBump::step3, and CbcPointer< Cbc >::valid(). Referenced by checkForPeekAndSpliceDone(), noteNegotiationError(), and PeekingPeerConnector(). References Security::PeerConnector::connectionClosed(), CommCommonCbParams::data, debugs, and CommCommonCbParams::fd. Referenced by Security::PeerConnector::prepareSocket(), and Security::PeerConnector::CbDialer::~CbDialer(). References Security::PeerConnector::callback, debugs, AsyncJob::mustStop(), and NULL. Referenced by Security::PeerConnector::commCloseHandler(), Security::PeerConnector::prepareSocket(), and Security::PeerConnector::CbDialer::~CbDialer(). References Security::PeerConnector::callback, AsyncCall::canceled(), and AsyncJob::doneAll(). Definition at line 132 of file PeekingPeerConnector.cc. References Config, SquidConfig::ssl_client, and SquidConfig::sslContext. References DBG_IMPORTANT, debugs, Comm::Connection::fd, fd_table, Must, Security::PeerConnector::noteNegotiationError(), Security::PeerConnector::noteWantRead(), Security::PeerConnector::noteWantWrite(), Security::PeerConnector::recordNegotiationDetails(), and Security::PeerConnector::serverConnection(). Referenced by Security::PeerConnector::negotiate(), and Security::PeerConnector::CbDialer::~CbDialer(). Updates associated client connection manager members if the server certificate was received from the server. Definition at line 317 of file PeekingPeerConnector.cc. References HttpRequest::clientConnectionManager, Comm::Connection::fd, fd_table, Security::PeerConnector::request, serverCertificateHandled, Security::PeerConnector::serverConnection(), and CbcPointer< Cbc >::valid(). Referenced by checkForPeekAndSplice(), noteNegotiationDone(), and PeekingPeerConnector(). Definition at line 138 of file PeekingPeerConnector.cc. References applyTlsDetailsToSSL(), assert, BIO_get_data(), Ssl::bumpPeek, Ssl::bumpStare, Ssl::bumpStep2, clientConn, HttpRequest::clientConnectionManager, Comm::Connection::fd, fd_table, HttpRequest::flags, AnyP::Uri::host(), Security::PeerConnector::initialize(), Must, NULL, Security::PeerOptions::parsedOptions, AnyP::PROTO_NONE, Security::ProxyOutgoingConfig, Ssl::Bio::rBufData(), RequestFlags::redirected, Security::PeerConnector::request, Ssl::setClientSNI(), ssl_ex_index_server, ssl_ex_index_ssl_peeked_cert, RequestFlags::sslPeek, HttpRequest::url, and CbcPointer< Cbc >::valid(). References Security::PeerConnector::callBack(), debugs, Comm::Connection::fd, fd_table, Security::PeerConnector::handleNegotiateError(), Comm::IsConnOpen(), Security::PeerConnector::recordNegotiationDetails(), Security::PeerConnector::serverConnection(), and Security::PeerConnector::sslFinalized(). Referenced by Security::PeerConnector::negotiateSsl(), Security::PeerConnector::start(), and Security::PeerConnector::CbDialer::~CbDialer(). Definition at line 212 of file PeekingPeerConnector.cc. References clientConn, HttpRequest::clientConnectionManager, Ssl::CommonHostName(), debugs, ErrorState::detail, Comm::Connection::fd, fd_table, HttpRequest::flags, RefCount< C >::getRaw(), handleServerCertificate(), AnyP::Uri::host(), Ssl::ErrorDetail::peerCert(), ConnStateData::port, Security::PeerConnector::request, ConnStateData::serverBump(), serverCertificateVerified(), Security::PeerConnector::serverConn, Security::PeerConnector::serverConnection(), splice, RequestFlags::sslPeek, switchToTunnel(), tunnelInsteadOfNegotiating(), HttpRequest::url, and CbcPointer< Cbc >::valid(). Definition at line 272 of file PeekingPeerConnector.cc. References BIO_get_data(), Ssl::bumpPeek, Ssl::bumpSplice, Ssl::bumpStare, Security::PeerConnector::bypassCertValidator(), checkForPeekAndSplice(), checkForPeekAndSpliceMatched(), debugs, Security::ErrorString(), Comm::Connection::fd, fd_table, Security::PeerConnector::noteNegotiationError(), resumingSession, Security::PeerConnector::serverConnection(), and ssl_ex_index_ssl_error_detail. References BIO_get_data(), Security::PeerConnector::checkForMissingCertificates(), COMM_SELECT_READ, commSetConnTimeout(), DBG_IMPORTANT, debugs, Comm::Connection::fd, fd_table, Ssl::ServerBio::holdRead(), Comm::MortalReadTimeout(), Security::PeerConnector::NegotiateSsl(), Security::PeerConnector::negotiateSsl(), Security::PeerConnector::negotiationTimeout, Store::nil, Security::PeerConnector::serverConnection(), Comm::SetSelect(), and Security::PeerConnector::startTime. Referenced by Security::PeerConnector::handleNegotiateError(), and Security::PeerConnector::CbDialer::~CbDialer(). Definition at line 255 of file PeekingPeerConnector.cc. References BIO_get_data(), Ssl::bumpPeek, Ssl::bumpStare, checkForPeekAndSplice(), debugs, Comm::Connection::fd, fd_table, Security::PeerConnector::noteWantWrite(), and Security::PeerConnector::serverConnection(). References Security::PeerConnector::closeHandler, comm_add_close_handler(), Security::PeerConnector::commCloseHandler(), Security::PeerConnector::connectionClosed(), debugs, fd_table, Comm::IsConnOpen(), JobCallback, and Security::PeerConnector::serverConnection(). Referenced by Security::PeerConnector::start(), and Security::PeerConnector::CbDialer::~CbDialer(). References BIO_get_data(), Comm::Connection::fd, fd_table, Security::NegotiationHistory::retrieveNegotiatedInfo(), Security::NegotiationHistory::retrieveParsedInfo(), Security::PeerConnector::serverConnection(), and Comm::Connection::tlsNegotiations(). Referenced by Security::PeerConnector::bypassCertValidator(), Security::PeerConnector::handleNegotiateError(), and Security::PeerConnector::negotiate(). Definition at line 339 of file PeekingPeerConnector.cc. References HttpRequest::clientConnectionManager, Ssl::CommonHostName(), debugs, Comm::Connection::fd, fd_table, Security::LockingPointer< T, UnLocker, Locker >::get(), Security::PeerConnector::request, Security::LockingPointer< T, UnLocker, Locker >::resetAndLock(), Security::LockingPointer< T, UnLocker, Locker >::resetWithoutLocking(), Security::PeerConnector::serverConnection(), and CbcPointer< Cbc >::valid(). Referenced by noteNegotiationDone(), and PeekingPeerConnector(). References Security::PeerConnector::bail(), Security::PeerConnector::callBack(), error(), and Security::PeerConnector::serverConn. Referenced by Security::PeerConnector::callBack(), Security::PeerConnector::certDownloadingDone(), Security::PeerConnector::checkForMissingCertificates(), Security::BlindPeerConnector::getTlsContext(), Security::PeerConnector::handleNegotiateError(), handleServerCertificate(), Security::BlindPeerConnector::initialize(), Security::PeerConnector::initialize(), Security::PeerConnector::negotiate(), noteNegotiationDone(), Security::BlindPeerConnector::noteNegotiationDone(), noteNegotiationError(), Security::PeerConnector::noteNegotiationError(), Security::PeerConnector::noteWantRead(), noteWantWrite(), Security::PeerConnector::noteWantWrite(), Security::PeerConnector::prepareSocket(), Security::PeerConnector::recordNegotiationDetails(), serverCertificateVerified(), Security::PeerConnector::sslCrtvdCheckForErrors(), Security::PeerConnector::sslCrtvdHandleReply(), and Security::PeerConnector::sslFinalized(). References Security::PeerConnector::al, asyncCall(), Security::PeerConnector::bail(), Comm::Connection::close(), DBG_IMPORTANT, debugs, Ssl::CertValidationRequest::domainName, ERR_GATEWAY_FAILURE, Ssl::CertValidationRequest::errors, Comm::Connection::fd, fd_table, RefCount< C >::getRaw(), Security::PeerConnector::noteNegotiationDone(), NULL, Security::PeerConnector::request, Http::scInternalServerError, Security::PeerConnector::serverConn, Security::PeerConnector::serverConnection(), Ssl::CertValidationRequest::ssl, ssl_ex_index_server, ssl_ex_index_ssl_errors, Security::PeerConnector::sslCrtvdHandleReply(), Ssl::CertValidationHelper::Submit(), Ssl::TheConfig, and Security::PeerConnector::useCertValidator_. 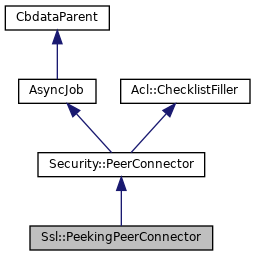 Referenced by checkForPeekAndSpliceMatched(), Security::PeerConnector::negotiate(), and Security::PeerConnector::CbDialer::~CbDialer(). References debugs, Security::PeerConnector::initialize(), AsyncJob::mustStop(), Security::PeerConnector::negotiate(), Security::PeerConnector::prepareSocket(), and AsyncJob::start(). References asyncCall(), Security::PeerConnector::certDownloadingDone(), HttpRequest::downloader, XactionInitiator::initCertFetcher, Downloader::nestedLevel(), Security::PeerConnector::request, AsyncJob::Start(), and CbcPointer< Cbc >::valid(). Referenced by Security::PeerConnector::certDownloadingDone(), Security::PeerConnector::checkForMissingCertificates(), and Security::PeerConnector::CbDialer::~CbDialer(). References MemBuf::append(), Packable::appendf(), buf, MemBuf::content(), Comm::Connection::fd, NULL, MemBuf::reset(), Security::PeerConnector::serverConn, AsyncJob::stopReason, and MemBuf::terminate(). References Security::PeerConnector::al, assert, Security::PeerConnector::bail(), Security::PeerConnector::callback, DBG_IMPORTANT, debugs, ERR_GATEWAY_FAILURE, RefCount< C >::getRaw(), NULL, Security::PeerConnector::request, Http::scInternalServerError, and AsyncJob::swanSong(). Definition at line 359 of file PeekingPeerConnector.cc. References Security::PeerConnector::CbDialer::answer(), Security::PeerConnector::callback, debugs, AsyncCall::getDialer(), Must, NULL, and Security::EncryptorAnswer::tunneled. Referenced by checkForPeekAndSplice(), checkForPeekAndSpliceMatched(), Security::PeerConnector::initialize(), Security::PeerConnector::noteNegotiationError(), Security::PeerConnector::sslCrtvdCheckForErrors(), Security::PeerConnector::sslCrtvdHandleReply(), Security::PeerConnector::sslFinalized(), and Security::PeerConnector::swanSong(). 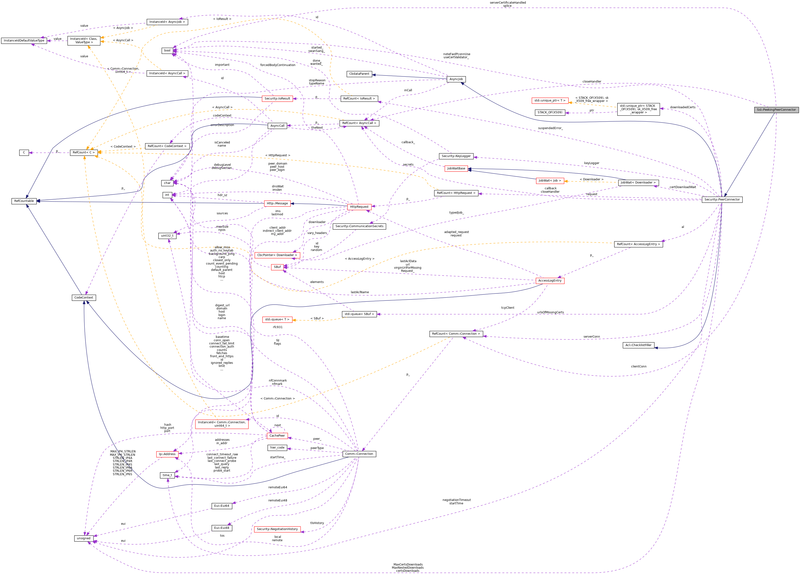 Referenced by Security::PeerConnector::bail(), Security::PeerConnector::callBack(), Security::PeerConnector::connectionClosed(), Security::PeerConnector::doneAll(), Security::PeerConnector::PeerConnector(), Security::PeerConnector::swanSong(), and tunnelInsteadOfNegotiating(). Definition at line 75 of file PeekingPeerConnector.h. Referenced by checkForPeekAndSpliceMatched(), initialize(), and noteNegotiationDone(). Definition at line 76 of file PeekingPeerConnector.h. Referenced by Security::BlindPeerConnector::BlindPeerConnector(), Security::PeerConnector::checkForMissingCertificates(), checkForPeekAndSplice(), checkForPeekAndSpliceGuess(), checkForPeekAndSpliceMatched(), handleServerCertificate(), initialize(), Security::BlindPeerConnector::initialize(), Security::PeerConnector::initialize(), noteNegotiationDone(), Security::PeerConnector::noteNegotiationError(), PeekingPeerConnector(), serverCertificateVerified(), Security::PeerConnector::sslCrtvdCheckForErrors(), Security::PeerConnector::sslCrtvdHandleReply(), Security::PeerConnector::sslFinalized(), Security::PeerConnector::startCertDownloading(), and Security::PeerConnector::swanSong(). Definition at line 78 of file PeekingPeerConnector.h. Definition at line 79 of file PeekingPeerConnector.h. Referenced by checkForPeekAndSplice(), checkForPeekAndSpliceMatched(), noteNegotiationDone(), Security::PeerConnector::serverConnection(), Security::PeerConnector::sslCrtvdHandleReply(), Security::PeerConnector::sslFinalized(), and Security::PeerConnector::status(). Definition at line 77 of file PeekingPeerConnector.h. Referenced by checkForPeekAndSpliceMatched(), and noteNegotiationDone().